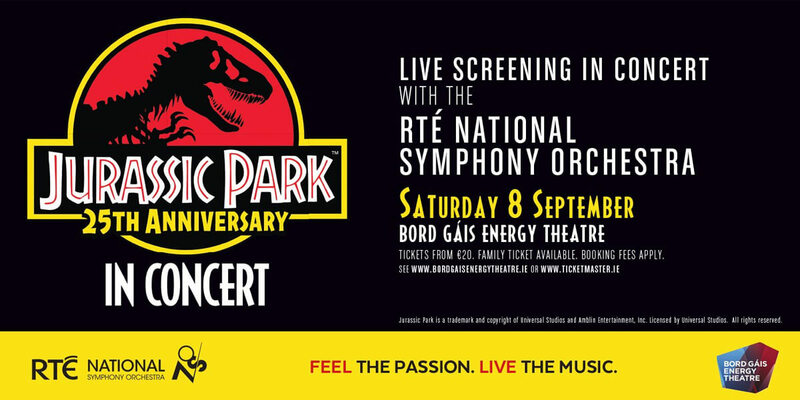 The RTÉ National Symphony Orchestra combines classic movie magic with live orchestra when it presents Steven Spielberg's Epic Jurassic Park at Bord Gáis Energy Theatre. Few films fire the imagination as much as Spielberg's Jurassic Park. When released in 1993, its CGI and animatronic dinosaurs were unlike anything the world had ever seen. Regarded as one of the most successful science fiction adventures ever made, it transformed the movie-going experience for an entire generation. Jurassic Park won all three Academy Awards for which it was nominated: Best Sound Editing, Best Sound Mixing and Best Visual Effects. Based on Michael Crichton's book of the same name, the film follows palaeontologists Alan Grant (Sam Neill) and Ellie Sattler (Laura Dern) as they are invited by eccentric millionaire John Hammond (Richard Attenborough) to preview his new theme park located off an island in Costa Rica that is full of live dinosaurs. However, when an unscrupulous employee knocks out the power grid during a tropical storm, the dinosaurs are unleashed, including the terrifying Tyrannosaurs Rex! Now audiences can experience Jurassic Park as never before – projected in high definition with the RTÉ National Symphony Orchestra performing John Williams' iconic score live to picture. Come along and enjoy every fascinating, suspense-filled, terrifying, skilfully calibrated minute of it!